Intuitive Design. Stunning Visualizations. Enhanced Mobility. Keep field service on-time and on-schedule. ThingX Mobile helps field service companies track their fleet, equipment, and mobile workforce in real-time. Map all your assets, field workers, and jobs on one screen. Get alerts when field workers are speeding, idling, off-schedule, and enter or exit a job site. ThingX Mobile is a responsive, intuitive, easy-to-use mobile application available on Google Play and the App Store. 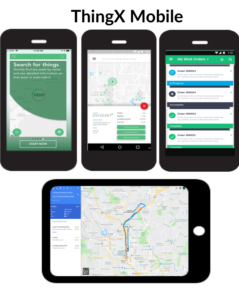 ThingX Mobile supports integration with EAM systems, GPS tracking solutions, and other enterprise systems via Open APIs. With ThingTech we can locate crews who aren’t available while on the job. Prior to ThingTech we would call, because it was too time-consuming to roll a truck to the site. Monitor routes, mileage, and time spent on each work order to identify where you can improve. Give your workers the most efficient routes to, between, and from job locations. Enhance the assignment and status of work orders to achieve real-time visibility. Take into account available tools and assets and prioritize important jobs and tasks, eliminating costs and misuse. Streamline operations by efficiently assigning the right job to the right worker. Access unlimited ThingX layers in map or list view. Improve route quality to reduce miles driven and fuel consumption. Gain visibility into routes, arrival and departure verification. Send work orders with location, job type, and other descriptive data. Easily view and edit asset records directly from mobile app. Attach files, pictures or videos to a work order. Boost efficiency with daily or real-time job scheduling. Prioritize important jobs and tasks, eliminating costs and misuse, based on available resources. Enhance dispatching and scheduling to help your field workers become more productive. Know exactly where your field workers are, where they’re going, and what resources and information they have access to. Connect field service operations with an easy-to-use mobile application that integrates with streaming data, EAM, and Salesforce CRM in real-time.